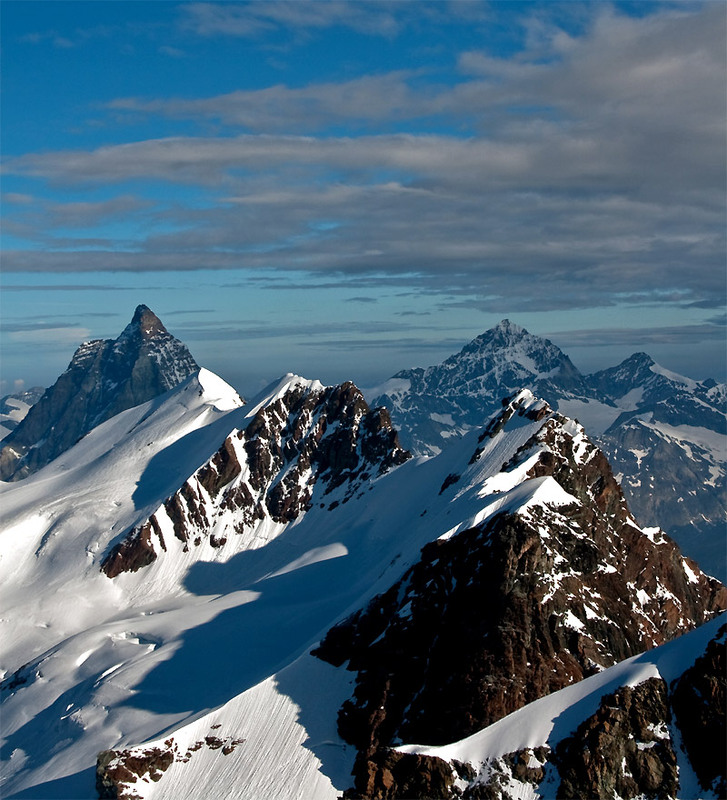 Monte Rosa has always been known and appreciated for its vast glaciers and high peaks. It is the largest mountain chain of the Alps and also the highest peak of the Helvetic Confederation. Among all the peaks, the Punta Dufour (elevation 4,634 m) is the highest and most ambitious. Equally important are the ascents to Punta Gnifetti, where at the summit is the Capanna Regina Margherita Refuge, and the ascents to the Lyskamm Occidentale and Orientale, with the possibility of crossing sharp ridges of snow and ice. Not to mention the less technical and difficult ascents, within the reach of less experienced climbers, like those of Castore and Polluce, which are exciting with their unique and breathtaking views. 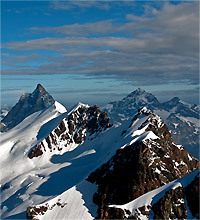 A splendid view of Lyskamm, the Matterhorn and Mont Blanc can be enjoyed from Castore’s peak. At 3,585 meters above sea level, we find the Quintino Sella Refuge. 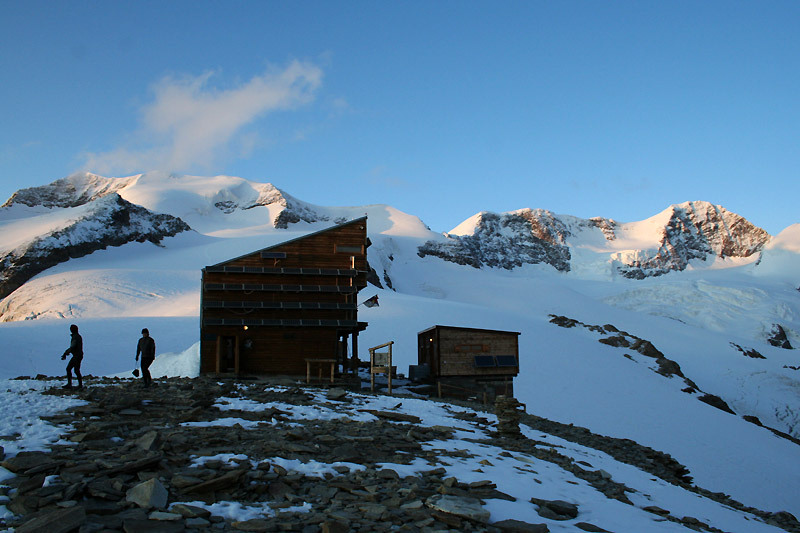 Situated at the base of the Felik glacier, the refuge is an important starting point for some of the most beautiful and interesting ascents of Monte Rosa. The most important ascents are the normal route to Punta Castore, the ascents to the Lyskamm Occidentale and Orientale, and the beautiful crossings of the massif like the Tour of Monte Rosa and the ascent to the Naso del Lyskamm. The first ascent of Monte Rosa dates back to 1778. The mountaineers of Gressoney, Valentino and Joseph Beck, Joseph Zumstein, Nicolas Vincent, Sebastian Linty, Etienne Lisco, and François Castel climbed as far up as the Roccia della Scoperto, a rock spur near Colle del Lys. In 1819 the Capanna Margherita, Europe’s highest meteorological observatory, opened, and in 1902 the first ascent of the southeast side of the Lyskamm Orientale was completed, thanks to the guides Francesco Curta, Giacomo Davide and Alberto Lazier. The following year, the Filder route was opened; the alpine guides Curtaz and Pellissier, along with Mrs. Grace Filder, scaled the Lyskamm Orientale, climbing the southeast wall. 1907 was the year of the first winter ascent of the Punta Dufour and a few years later in 1911, there was the first Italian ascent on the Nord del Lyskamm, as well as the first ascent of the southwest ridge of the Castore by the alpine guide Antonio Welf and his client Carlo Fortina.